Thursday, we went to the War Memorial of Korea for a commemoration of “those of Irish birth and heritage who fought and died in the service of the United Nations and those civilians of Irish birth and heritage who died side by side with the Korean people – Korea 1950-1953”, as it says on the Irish memorial at the War Memorial of Korea. Above, you see Frances Fitzgerald, Irish Minister for Children & Youth Affairs laying a wreath at the Irish memorial. 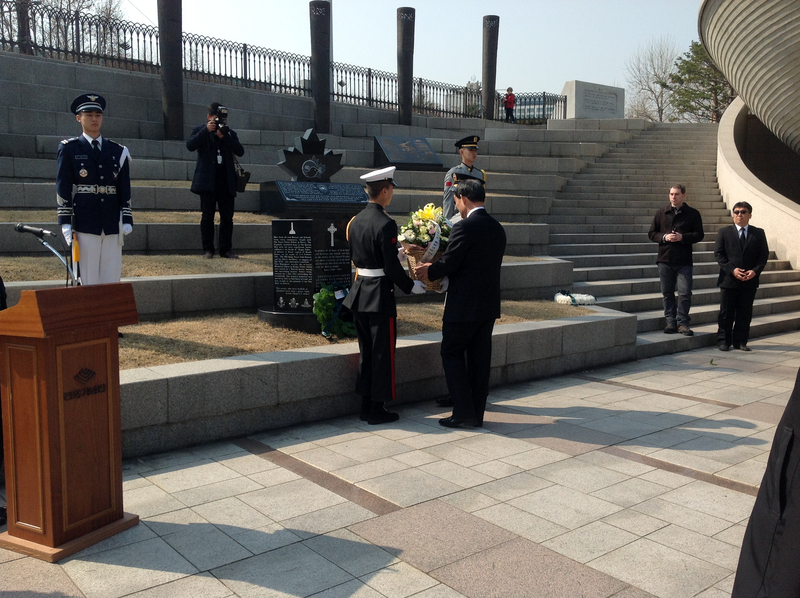 Minister Park, the Minister for Patriots’ and Veterans’ Affairs, represented the Korean Government, and laid a wreath. The third wreath, for the Irish civilians who died in the war, was laid by Father Sean Conneally. The Minister laid a wreath on Members of the British, Australian & New Zealand military (from their respective diplomatic missions here) also attended. There were two readings, first “The Korean Lament” by Mark McConnell, an Irish veteran of the Korean War, read by Aingeal O’Donoghue, Ambassador of Ireland, and then “The Exhortation”, read by Oliver Cunningham, an Irish-born US Army colonel (retired). See below for video clips. The War Memorial of Korea includes a large museum about the war, which is very well laid out and quite interesting. 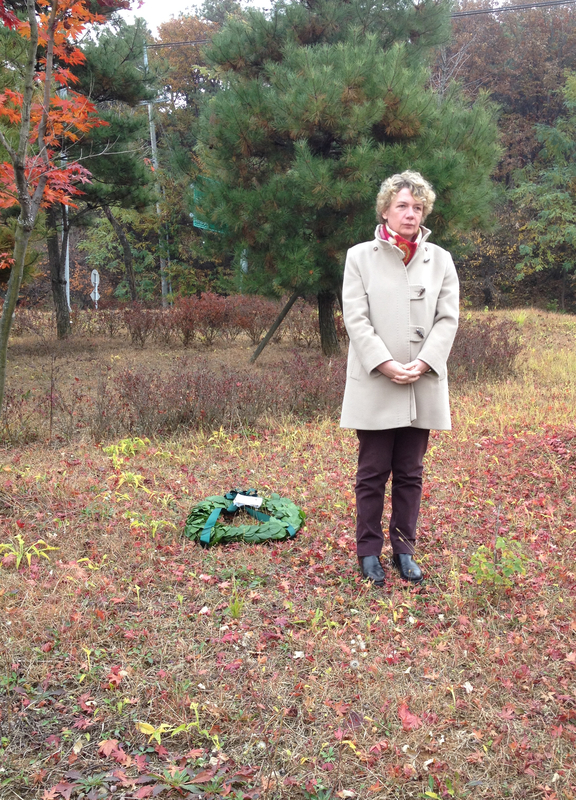 I haven’t been through the whole thing, but did go through much of it when we visited the “Happy Valley” battle site with the Irish Association of Korea, on a tour led by Andrew Salmon last autumn. 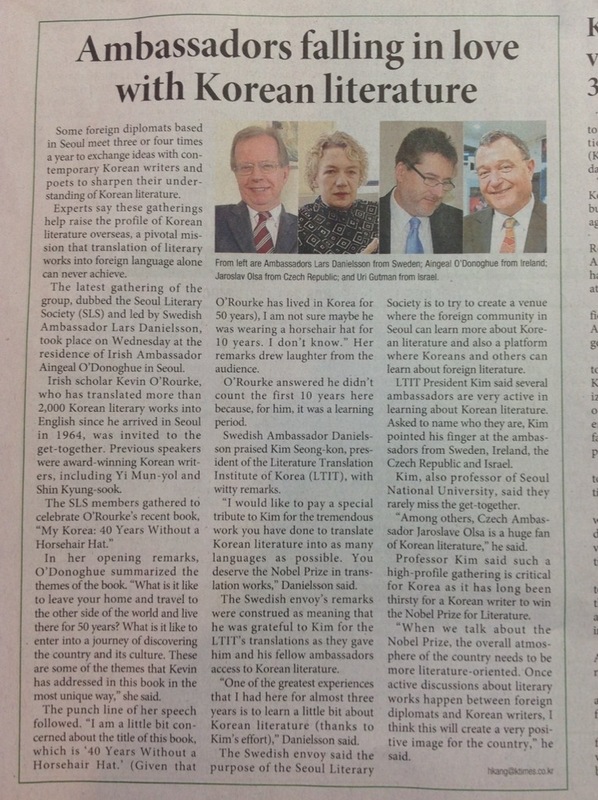 We had a book launch here at the residence last week (hopefully a longer post on that later…), which was featured in the Korea Times’ “Embassy Row” section today.